Cults Tennis Club was founded back in 1887 (which makes us 131 years old this year!) and today has six floodlit artifical grass courts playable (almost!) all year round. Two of the artifical courts were resurfaced as recently as 2016, with a further two in 2015.. The club currently has a comprehensive coaching programme led by Gareth Rennie, and a vibrant social calendar to suit all ages. Cults Tennis Club welcomes players of all standards and prides itself in being a family orientated club. We have coaching available from 5 years all the way through to adult beginners! There is really something for everyone (even those who have only picked up a racket on holiday!). 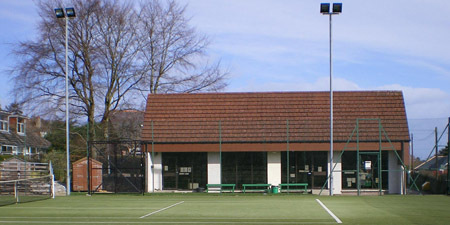 The clubhouse boasts a lounge area, junior area (with table tennis & pool table), changing rooms, a kitchen, and it's very own tennis shop linked to Thistle Sports on Rose Street. The club is run by a dedicated number of volunteers who work hard to offer a wide variety of activities for all ages to ensure its smooth day to day running as well as longer term planning and maintenance. Without volunteers, there would be no club! Fancy a game of tennis and not sure who to ask for a game? Why not come along to social tennis which consists of players mixing in, playing one short set, then changing partners/opponents. This is self run by the players themselves, can prove popular sessions especially during the summer months. This is a great way to get to know other members of the club. There is no need to sign up.....just come along and play!! Social tennis times - Tuesdays & Thursdays (9:30am to 11:30am) / Saturdays & Sundays (2:00pm to 4:00pm).